Sweat out the toxins and lose inches! 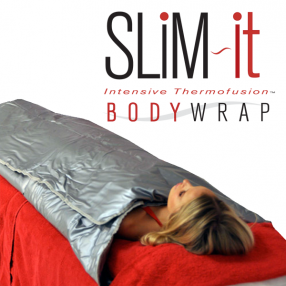 SLiM~it FXP Intensive Thermofusion Body Wrap is a simple, self-service wrap that produces amazing results. The easy-to-use kit includes 4 key self-applied body products, dietary supplements and a unique infrared heat source to stimulate the body product penetration. SLiM~it is the perfect solution to provide a constant stream of retail revenue for the business owner. The SLiM~it FXP Thermal Blanket features carbon infrared, three (3) heat zones and touch control for perfect Intensive Thermofusion.